Congratulations to our candidates that were confirmed by Bishop Michael last Sunday. It was a beautiful and memorable occasion and thank you to all involved. This week we will be celebrating a Welcome Mass and invite all families to support and welcome new children and some new families into our parish. 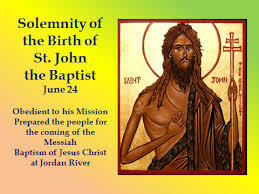 John the Baptist is about 6 months older than Jesus, and he is the one who baptizes Jesus. John's father is Zacharias and his mother is Elizabeth. They were both faithful to God. Ask your children to tell you the story about Zacharias and John. It is a good one. The two great Apostles, Peter and Paul, are at the very foundations of the Church. These are two saints who appear in the Acts of the Apostle and are the key figures who began to build the community of the church from the teachings of Jesus. It remains in many respects as we know it today. They are the solid rock on which the Church is built. They are at the origin of the churches faith and will forever remain its protectors and its guides.